This town 25 miles from Boston gets the spotlight once a year as the starting point of the Boston Marathon. During the other 364 days, Hopkinton is a relatively quiet place. Green space is abundant, with an 84-acre forest in town, plus seven local parks. But there's industry too: tech corporation EMC has its headquarters here. The town is currently planning to rejuvenate its aging downtown. 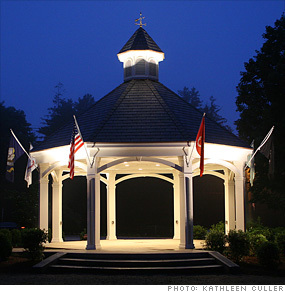 For now, residents can enjoy a newly built gazebo. --R.G. Become a Facebook fan of Hopkinton! Is Hopkinton a great town, or what?